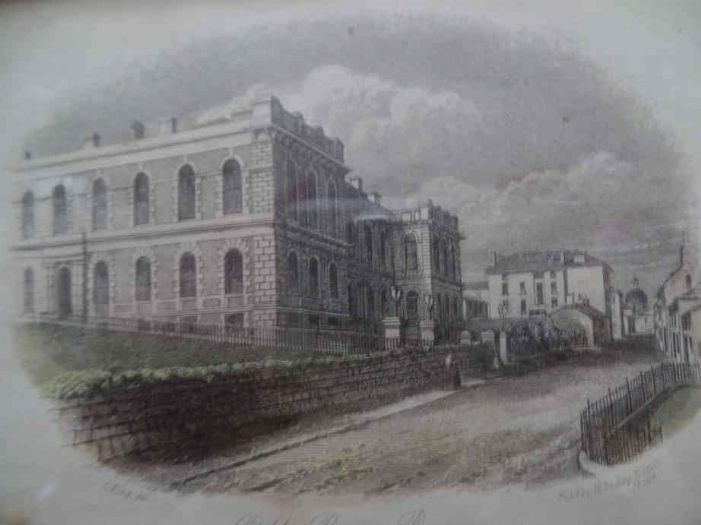 On 27th April 1864 not one, but three foundation stones were laid to start the building of the Penzance Public Buildings. The plans for the building were drawn up by John Matthews, the Borough Surveyor and it was to be built by Messrs Olver and Son of Falmouth who submitted the lowest tender of £9,695. The previous ten years had seen various proposals put forward to erect new Public Buildings as the existing Town Hall and Borough offices at the Market House were inadequate, but the refusal of a Treasury loan halted earlier schemes. Built of granite from Lamorna Quarry in an Italian style, the new building was intended to reflect the growing prosperity, importance and civic pride of Penzance. The new building was in three sections – the East wing owned by the Corporation and containing the Guildhall which was used for Law Courts and Council Meetings until 2011 and 2013 respectively; the West wing owned by the Geological Society and to be used for their museum, meetings and research work and the central area owned by the Public Buildings Company made up of 112 mainly local subscribers, to be the Public Rooms, including a lecture and music hall able to accommodate 1,000 people. Penzance Public Buildings, private collection. It was a day of great celebration that started at 12.30 with lunch for local dignitaries and invited guests at the Western Hotel. The Cornish Telegraph described it as “a feast …worthy of the palmiest days of festive bounty” detailing the vast selection of meats, fish (including “shell-fish both in their horny coats of mail and macerated into salad”), jellies, trifles, blancmanges and wines that were served. Lunch was followed by a civic procession down Market Jew Street slip, around the Market House and up Causewayhead, into Clarence Street and then down to the Glebe where the ceremony was to take place. The Glebe had been the site of the town’s Corpus Christi Fair for many years but was now to be the site of the new building. Everyone who took part in the procession wore white gloves, the Corporation wore white rosettes and the secretaries of the Geological Society and members of the Public Buildings Company wore crimson sashes. A reported 4,000 people witnessed the stone laying ceremony using every possible vantage point including roof tops. The three foundation stones, each weighing over two tons, hung from triangles decorated with flags and banners and were suspended across the Glebe field. Each stone would be lowered onto smaller blocks of granite already in the ground and each of these smaller stones had apertures cut into them. Proceedings began with prayers and a psalm sung by Penzance Choral Society and accompanied by its orchestra. Next John Matthews delivered his plans to the representatives of the three sections of the building before the ceremony began. The Mayor. RAG Davies laid the first stone for the East wing. He went down a ladder into a wide trench and placed a commemorative scroll and a closely sealed crystal cylinder containing coins from 1864 together with some Maundy money and a photograph of the Mayor, into the aperture in the sunk stone. Then using a specially inscribed silver hammer and trowel he covered the sunk stone with mortar ready for the lowering of the foundation stone. Once lowered, the Mayor struck the stone three times and pronounced it laid. The same procedures were followed for the laying of the two other stones. Charles Fox, President of the Geological Society, laid the stone at the west end of the site and here the coin bottle also included Cornish tokens struck at Scorrier House inscribed “Success to Cornish Mines” and “Success to Copper, Tin and Fish.” Day Perry Le Grice, High Sheriff of Cornwall, laid the foundation stone for the Public Buildings. The coin bottle also contained a list of the 112 shareholders in the company but there was a brief incident when the stopper fell out of the bottle and it took some time before the wax could be removed and renewed. Once all three stones had been laid there were further prayers, the singing of another hymn followed by speeches from the three men who laid the stones. The Mayor said it was the proudest moment of his life and that the new building would be “a monument to the public spirit of our generation.” It was a scheme many years in the planning but “good fruit takes time to ripen.” Charles Fox spoke at such length that the newspaper did not have sufficient space to report his speech whilst Mr Le Grice emphasised that subscriptions raised for the Public Building largely came from people living within two miles of the Market House. The civic party then returned to the Town hall before attending a dinner for 85 guests at the Western Hotel at 5 o’clock. Many toasts were made and for some, the festivities extended well into the evening.